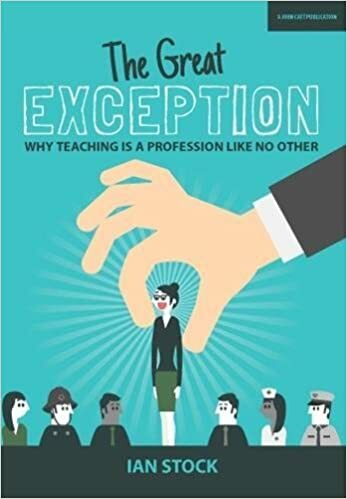 Just a reminder that my book The Great Exception – Why teaching is a profession like no other is still available here. This is a very thought provoking book. It is a challenging read, but once you get into it, it prompts you to reflect on what and how we should be teaching our children. These days, education seems to be all about exam results, but the author argues that there should be more to it than [apparent] academic success. He examines the nature of teaching and learning in depth and successfully makes a case for more autonomy for teachers, who at present, are to some extent hampered and frustrated by prescriptive guidelines on how to manage their classes. Teachers in training could learn a lot from dipping into ‘The Great Exception’. …I want to discuss here the conflicts that the systems-approach creates in terms of what it actually means to be a teacher. The choice of words is important: to be a teacher, not simply to teach. The latter implies a specific physical activity that can, at least in theory, be defined as a discrete set of actions which can therefore be specified and measured. It also implies a recruitment process that is focused on technical proficiency that can be both easily defined for the purposes of job advertisements and judged during the recruitment process. It supposedly makes the evaluation of that process relatively easy when it comes to the whole matter of appraisal, reward and even capability proceedings. However, it overlooks the crucial matter discussed above – that much of being an effective teacher is a matter of personal qualities and characteristics that are neither easily identified nor measured. These non-cognitive qualities may be difficult to identify – but they are often the things that determine what sort of role-model an individual will make – and thereby what context they will generate within which to exercise more specific skills. As Hilary Wilce has observed, children tend to take their leads from role model behaviours not instructions – and it is for this reason that wider teacher-qualities and behaviours are so important. That schools have to operate within a regulatory framework that promotes quantifiable, accountable decision-making is, of course, not their own fault; neither is it necessarily an undesirable thing in itself, as there clearly needs to be some mechanism for regulating these processes and identifying out-and-out malpractice. However, the presence of such defined, black-or-white prescriptions for teaching can easily cause wider issues to be forgotten under the onslaught of an officially-sanctioned ‘truth’. The ways in which such constraints are then interpreted can lead to a narrowing of job descriptions and a loss of appreciation of the actual qualities that make up a successful teacher, many of which are indeed intangible. However, the latitude for autonomy and self-determination that can be read into such frameworks by individual managements can still make matters significantly either better or worse, as suggested by the varying degrees of teacher freedom observed from one school to another. The fact that teacher-specifications have increasingly focused on technical capability at the expense of more indefinable personal qualities may be a reaction to outside circumstances, such as the need to widen the field of potential teachers to those who perhaps lack natural talent or insight, but who are nonetheless needed on sheer numerical grounds. Likewise, anti-discrimination legislation has perhaps forced more specific criteria on those involved in recruitment. But it has nonetheless shifted general perceptions of what it is to be a teacher, from that of someone with desirable personal qualities to that of ‘mere’ technical ability. I suppose it’s just yet another Holy Grail to hope that the teaching profession in Britain might ever reach a steady state. I remember my former head teacher saying in the early nineties that henceforth the only constant would be change. Maybe that has always been true, and the perception that there were (and are) steady states is just an illusion. Change probably is endemic. But one is still entitled to wonder where it all gets us. While the physical world marches to its own rhythm, change in social constructs such as education is a more controllable matter. And we might wonder whether the fundamental need that people have for cognitive development has really changed so much that the constant upheaval is justified. I came to the conclusion that most change in professional circles is really about people’s perceptions of what they are doing – and about power-play: who is in charge and whose world-view takes precedence. It is not much about delivering the basic service at all. Recent trends have only bulwarked the authority of those at the top of the greasy pole, and made it all worse. The problem with teaching is that nobody really knows – let alone can agree – on what it is and what it is for. That, despite the essentially simple process of spending time with children and exposing them to things they have yet to encounter. High amongst the confusions come the ceaseless calls to improve the ‘professionalism’ of the profession. Nobody seems to know what that means either; it is just more empty words. For school managers (and perhaps their political bosses) it probably means a workforce that does whatever it is asked with maximum effort and minimum dispute. Which might be fine, if what was being asked was both uncontentious and sustainable – but it is neither. Then there is the view (which managers mostly seem to hate), that professionalism is about the ability to operate autonomously, within a set of guiding ethics, and still achieve largely good outcomes (although those outcomes themselves are not beyond question). This seems to me a much more viable model, especially in a field as nebulous as education, but it means allowing people more latitude than the current gate-keepers are willing to grant. It also means accepting the inherent uncertainty of the process, something that those being held to account are understandably reluctant to do, no matter how little they can really change it. Attempts have been made to impose order and standards on the profession by the establishment of various bodies. But their legitimacy is questionable when they are not composed – voluntarily – of the majority of the grass-roots individuals that they purport to represent. So I am far from convinced that it is possible to increase professionalism simply by imposing structures: in the final reckoning, professionalism is a state of mind, and only the owners of said minds can really control it. Here we return to the dichotomy mentioned earlier: should the professional state of mind be one of compliance with institutionalised norms (laid down by whom?) or should it rather be a state of independence to follow one’s conscience and experience – albeit probably within a general ethical framework? Until such matters are resolved, it is unlikely than any greater semblance of professionalism will be achieved. In the case of other professions, one might observe that status is indeed conferred by membership of august bodies – though they are usually controlled by their members rather than outside agencies. But this form of institutionalism is no guarantee of professional behaviour either – only a recognition of it (or not, as when people are struck off). Here we come to perhaps the most uncomfortable point of all, for those arguing for a grass-roots definition of professionalism: there is simply no shared understanding of what it means. I can think of very many individuals over the years who, while technically competent, exhibited all manner of behaviours and attitudes that I found professionally questionable. Perhaps they thought the same about me. What are we to make of the Advanced Skills Teacher who was found to be having a relationship with a student? And there were many lesser manifestations of individual attitude that I certainly did not agree with. Then there is what one perceives as one’s own responsibilities. In my view, a professional should have a degree of ‘benign remove’ from his or her clients (and employers) so as to retain the necessary detachment from partisan interests. How else can ethics be upheld? But I was regarded as old and pompous by the teachers who seemed to perceive themselves more as children’s buddies and life coaches (or management lackeys), things that I found verged on the puerile and professionally compromised. It seems that attempts to engage with the mainstream teaching body as a profession is stymied by one simple fact: many of those concerned simply aren’t interested. What they want is to have fun with children; or failing that, to drill exam statistics out of them (which is not at all the same thing, but not much better). Or more charitably, just to do their job. Unlike the researchers, whose interest most often strikes me as nerdishly academic, or the managers whose interest most often strikes me as blindly corporatist, ordinary teachers most often have only a vague sense of belonging to a discrete profession, let alone one that has any sense of dignity. They are more interested in something to get them through the next lesson than the underlying philosophy or psychology of what they are doing. And the short-sighted technocracy which now passes for teaching standards is only making it worse. Much of the lack of interest is also due to simple time pressure. Full-time teachers are just too overloaded to have much left for the niceties of what they are doing, let alone membership of professional colleges: that is for those who are already looking for ways to escape. Neither is climbing the management ladder (which seems to be the sole reason many suddenly find interest in meta-educational matters) for everyone. But we are still left with the same dilemma: those who want to apply ‘standards’ don’t understand that imposition is actually the last way to succeed – while those responsible for the day-to-day upholding of said standards seem to have little conception or concern for what that might mean, beyond its simplistically being “all for the children” (which is something else I’ve questioned before now…). I can hardly be the only person who has attempted to square this circle unilaterally, by self-equipping with the philosophical background that was otherwise conspicuously lacking. In my opinion that is the only way it can be done which is why, in certain other countries, teachers are expected to have higher degrees, even doctorates, before they can teach. I tried hard to develop my own strain of professionalism in my work: in this blog, in my book and in my contributions to CPD. My approach (though categorically not the content) was sometimes criticised for being over-academic; for my part, I could not see why mature adults should not be able to raise their own outlook above the ‘fun and group-work’ that they deliver to their pupils. We do not need to conduct professional discourse in the manner of Year Nines. Yet it was my approach that was (supposedly) found wanting in the end; my determination to retain high professional and intellectual standards was apparently not pupil- (or data-) friendly enough – even though the same school was exhorting its teachers to deliver high academic standards. There was a personal dilemma all of its own in there: I found insight that I am certain enhanced my own professionalism – only for it to be ignored, and ultimately rejected, by a blinkered establishment. I can only assume that the individuals concerned either could not see the contradictions in that, or had no real idea what they were talking about. What kind of professionalism is that? Tonic for Teachers introductory offer! Now that the new school year is well underway, time to think about professional development? Tonic for Teachers is a programme of fifty short audio commentaries (and associated downloads) on issues pertinent in education in the widest sense. Developed in the U.K. from a successful series of delivered CPD sessions, it discusses the nature of the teacher’s craft and sets it in a wider philosophical, psychological and social setting. Available for a short time only at an introductory rate of approx. £10.00 (charged in Aus$) for unlimited access. What separates an expert from a novice is not purely technical procedure. It is insight and interpretation – the refinement that allows the expert to ‘read’ a situation more fully and to respond in more nuanced ways. There is little available in the world of teacher professional development to cater for this need. Tonic for Teachers is the new online resource that I have created to address this need, using materials from popular and successful CPD sessions and developing many of the ideas proposed in my book The Great Exception. For a modest one-off payment, it gives access to fifty short short audio commentaries totalling over five hours of material, together with downloadable hard copy, other resources, video links and more, aimed to make it as accessible as possible for busy working teachers. The aim is not to provide quick-fix classroom tricks, but to promote growing insight and increased resilience in classroom practice. Find out more at Tonicforteachers.com or enroll directly at Open Learning and please share! Priceline.com was an online company that sold excess airline capacity. By the year 2000, the stock market had capitalised it to the tune of $150bn, or more than the value of the entire airline industry. That was, of course, before the dot-com crash of that year. A similar effect was seen pre-2008, when Northern Rock amassed loan liabilities of over £100bn on assets of a mere £1.5bn. Reading further into Aeron Davis’ book, it becomes clear how such bubbles arise: herd behaviour dictates that more and more people pour investments into a company simply because others are doing the same. Even though people know this is risky behaviour, the short-term consequences of not doing so, in terms of lost shareholder confidence – and thereby even senior jobs, are too great. Bad practice is thus actively rewarded – and when the crash ultimately comes, those at the top simply blame everyone else, walk away, and move on to their next executive post. In both crashes, there were a few individuals who warned of what was to come, and adjusted their behaviour accordingly. They tended to make lower returns – and thus paid with their jobs, in some cases a matter of weeks before they were proved right. Education can’t have bubbles like this – or can it? Reading Davis’ account, I could not help but consider the possibility that it does, in the form of ideologies. The recent history of education is one of a sequence of fads that gained traction, and were wheeled out across the nation via the networking of senior managers and agenda-shapers. We have seen AfL, The Growth Mindset, Effect Sizes, Brain Gym, Thinking Hats, peer-assessment, green pens, triple marking and more follow this trajectory. Sometimes they originate in research, but quite often they seem to generate their own self-justifying ‘evidence base’ which is used to bludgeon people into compliance. For a few years, everyone piles into the latest idea, whose supposed value rapidly balloons until no one who claims to be serious about education can afford not to be doing it – and talking about it incessantly. Some build entire reputations on such behaviour. And then the bubble bursts – not so much from financial unviability, but because the fad turns out to be unworkable, or because it does not after all deliver the demonstrable improvement in learning that it promised. I have sat in meetings where certain stellar individuals openly panned the very ideas they had been championing just a few years earlier – but by then they were onto the Next Big Thing, their careers safely intact, unlike the sanity of those who had been charged with implementing their now-disowned schemes. The collateral damage is not so much out-of-pocket shareholders as out-of-education teenagers whose schooling experience was badly distorted by such recklessness, not to mention the frazzled lives of teachers who were required to jump through yet more hoops in the process. There are bubbles of different sizes too. Those within individual schools may be of quite some concern – but the impact of, for example, the bubble that promoted Free Schools is another matter entirely – in this case the disrupted education of those whose schools are increasingly closing mid-way through exam courses. Those consequences are not imaginary. In all cases, education bubbles are caused in precisely the same way as financial ones: fads that no one can be seen to be ignoring, that create bandwagons of questionable practice, which can only have one conclusion. Yet everyone is required to take them deadly seriously at the time. One might have hoped for something more considered from the thinking part of society, but it seems the pressures for herd behaviour and the desire of some to build reputations and careers are just too strong. And as in the financial sector, those who refuse to go along are penalised for their restraint with lost career progression and in some cases their jobs, for not using enough green pen, or not using group work, or failing to cook their pupils’ data records to satisfy the target-mongers. Let alone what befalls those who stand up and publicly say that the whole thing is wrong. Oops. That’s getting personal again.